Whether you’re feeling the pinch as hard drive space runs low or you’re just wondering where all your disk space went, it’s easy to find large files in Mac OS X by using the built-in search tools. You don’t need to use any third party tools here, instead you’ll rely on search operators and the excellent Spotlight locating functionality that is a core feature of all Macs. 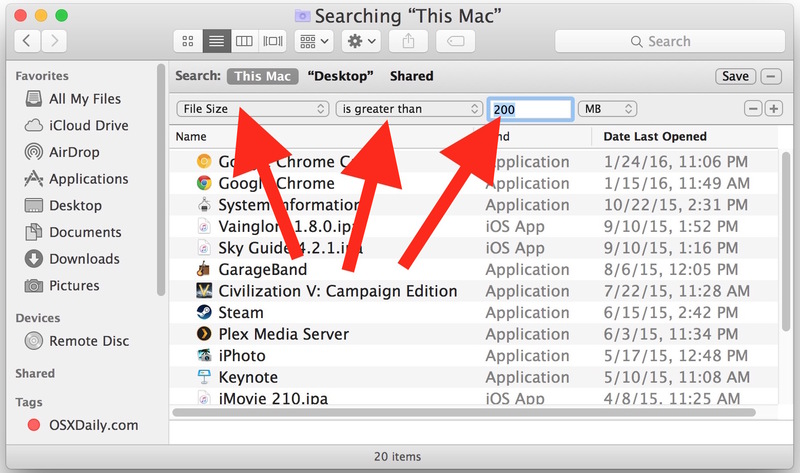 If you’ve never used these specific features of the Mac search function before, you’ll find it’s simple to do, just follow these steps to locate files and items based on their size. The file and app list below will automatically update as anything larger than the specified file size is found on the hard drive. 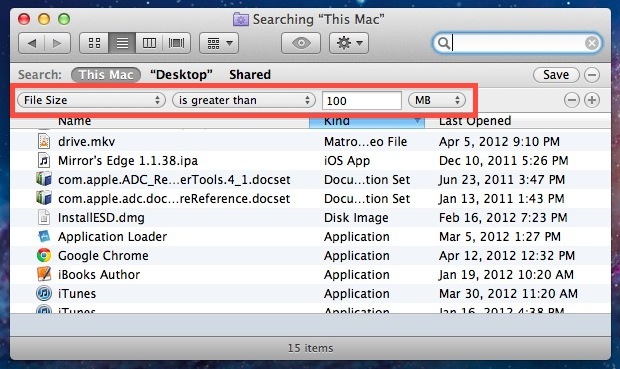 Be sure that “This Mac” is selected if you’re getting limited results, though you can also use the search limiters to find large files contained within single folders or user directories. This feature is the same in all versions of MacOS and Mac OS X, regardless of the version, naming and spelling convention. Want to use this feature to track down large files often? Click on the “Save” button in the upper right corner and you’ll turn the File Size search into a Smart Folder that can be easily accessed from the sidebar for easy future retrieval, plus that folder will constantly be updated with large files only, making it a very useful way to instantly find any big item laying around on a Mac. If you’re hunting down large files because you’re running low on hard drive capacity, don’t miss these tricks to free up disk space on any Mac. Even if you’re not in dire need of more disk capacity, it’s pretty much guaranteed that you can use a tip or two from that list to find and recover some disk capacity. One very common pit of enormous files is the user Downloads folder, which often contains .dmg .zip and other downloaded items that have long since been forgotten, so don’t be surprised if you’re using the file size search and discover that directory is consuming much of the disk space, or at the very least, is the primary location of many large files. Typically that directory can be cleared out with little impact, though you will want to confirm the contents and the necessity of keeping them around yourself before making such a drastic move. Great tip, but it’s made much more useful if you use Size as a sort item too so you can find the biggest items on top of the list. On Lion you can add columns on finder. Add Size column before or after the search and tap/click on the column name to order by the column. Good trick…and you know what…i have Google Chrome that is almost 1.5GB…how can be possible?? Depending on what you may have installed as an add-on for Google Chrome, your Google Chrome’s file size will either change drastically, or have a minor change. If you have Google Drive installed, that may also affect your Google Chrome’s file size. Anybody knows how to filter files by kind, to show ony mpgs or xmls like in Win7? There is a great visualizing app for this issue – Disk Inspector. Thanks for the useful tip. I had files that I thought I’d thrown away a long time ago. Hey, THANKS!!! I wanted to very quickly open space on my SSD, without fiddling around with 3rd party programs. Turned out some music FLACS were taking up HUGE space, way more than I thought, and their download images as well. Killed out 9 GB and counting as I type, you are my hero! With Snow Leopard, the option to view the Size column is greyed out and can’t be activated. That’s the best tip so far on how to find those files. Search inside HDs are the worst part of a computer. This is a nice search function, but it doesn’t show large folders, e.g. my 10 GB Microsoft User folder for Outlook. How can i find these large folders? Following the instructions is sufficient to narrow down large file sizes, it should be sufficient and works as described. Have a coffee because it takes a while. This will show you large files AND folders with lots of files. This can be speeded up by putting grep in the middle which only passes large things to the sort, using the size at the beginning of the line.